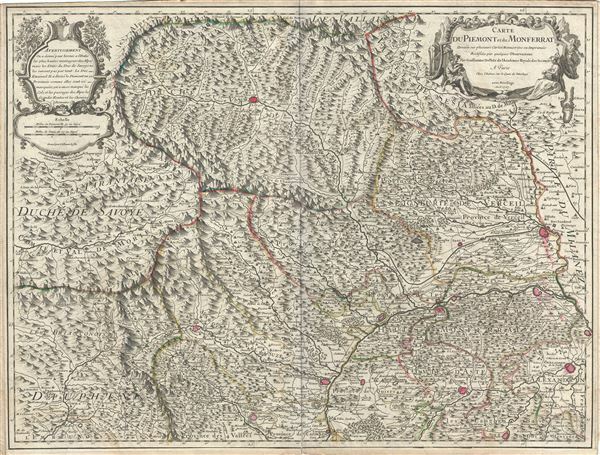 This is a beautiful 1707 map of Piedmont, Italy by Guillaume De L'isle. It covers the northwestern part of Italy as well as parts of France from Alagna Valsesia south to Carignano and from Valloire in France east as far as Valenza in Italy. The map renders the entire region in extraordinary detail offering both topographical and political information with mountains and forests beautifully rendered in profile. The region of Piedmont is famous for a variety of Italian wines. The Barola and Barbaresco wines and the sparkling wine Asti, all come from this region. A beautiful title cartouche appears in the upper right quadrant of the map, while the upper left quadrant features another cartouche containing the scale and 'avertissement.' This map was created by Guillaume De L'isle in 1707. Very good. Minor wear along original fold lines. Original platemark visible. Minor spotting at places.